This is a question I stumbled on from an exam. Has anyone got an idea? So I'd guess D. D also is connect diagonally like all the others. But, I have no idea what the vertical position would mean, nor why 81 would be represented using a white token instead of simply going with an 8 and a 1. I'm also not sure why the board/grid looks like it does, with that bar at the top. 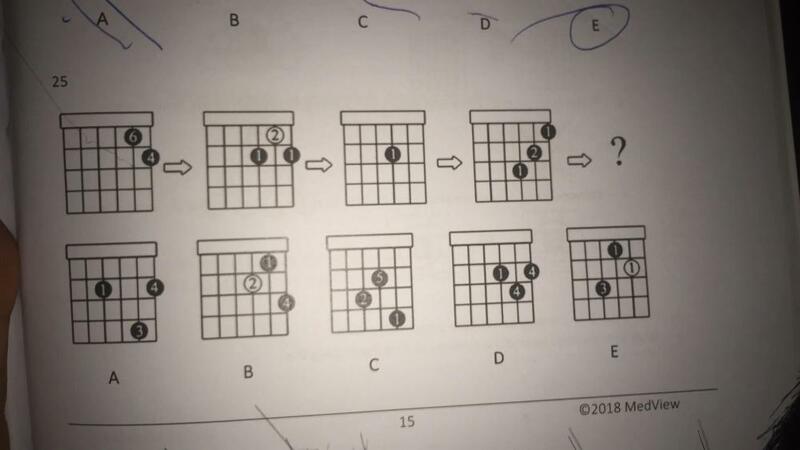 Is it from a music exam? Those look sort of like patterns for fretting the strings of a guitar. But most of them aren't conventional chord shapes and the numbers don't make sense since most people don't have six fingers on their fretting hand.